Hi there, Jessica with you today. I hope you have enjoyed your month of September. Can you believe it is almost over????!!! Seems like we were just talking about the first day of school, and now we are almost a month in here. Well today I wanted to share an altered frame I made the other day. I was in my LCS and saw this wooden frame for only $1. So I impulsively spent money I didn't have to buy this frame...lol. I just love the way it turned out, and couldn't wait to share it with you. I used the gorgeous LEAF image from QKR Stampede. I started by Mod Podge-ing the brown paper onto the frame. Next I used my Cricut to cut the word "Fall" from some fall patterned paper. Next I added the leaves. Here is a close up of the leaf image. Didn't it turn out soooo pretty? I just love the way it ended up looking. I used the baby wipe technique to create this. If you have never done that there is a great "How-to" HERE. It is really very simple, and turns out some gorgeous results. I used 4 different re-inkers to make this one (brown, red, orange, and green). Since I had the baby wipe "ink pad" made, I ended up stamping off like 6 of these. The cool part is each one is just a little different. As the baby wipe sits, the ink blends a little more. Last, I added some bling. What fun is a project without bling???? I added some heat set crystals in a swirl pattern. The swirls reminded me of wind blowing in the fall. Well that is all from me for now. Be sure to stop back soon...the new Design Team will be announced soon! I can't wait to see all the new talent that will be part of the QKR Stampede Team! For this card, I've used the Wizard stamp from the store. It is so cute and fun, just like the rest of the stamps at QKR Stampede! This stamp can be used for so many different cards, whether it be birthday, halloween, costume party invitations, or just for fun! The possibilities are endless! Thanks for stopping by the QKR Stampede blog today! Hello friends! 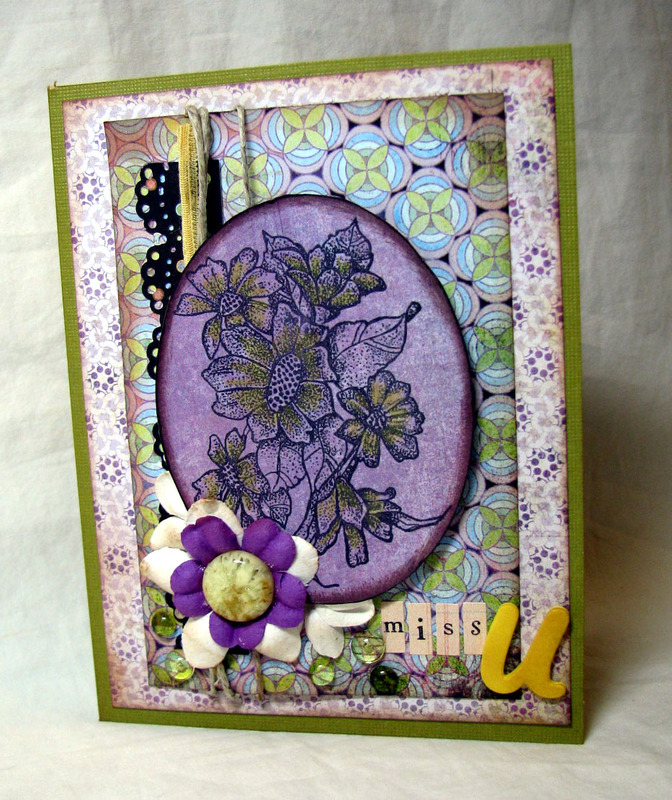 Jenn here to share a card I created using a floral stamp called Flower accent. I love how this stamp can be used for so many different occasions. I created a card to tell a loved one I miss them. The image is stamped using a Momento ink pad in Black. I then just added a touch of color to the flowers with my Prisma Color pencils. I love the vintage feel of this when used this way. I used some Basic Grey paper and a few flowers and dew drops for embellishments. Miss U is done with Making Memories letters and a Thickers U in yellow. Of course to add to the vintage I had to give it all a dusting of Distress ink in tea dye. HI there! Jessica here with you today. 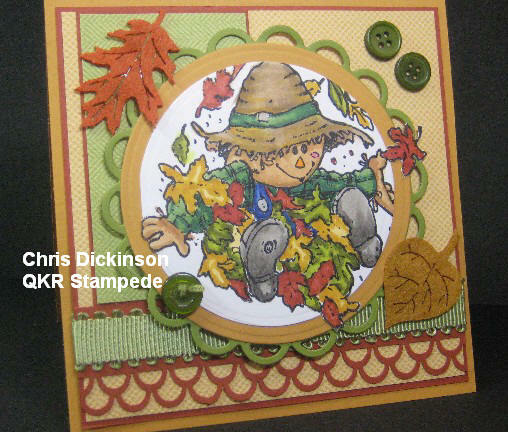 Today I wanted to share a card with you using the LION stamp from the QKR Stampede store. I know you have seen this guy before, but I just think he is sooo versatile. There are so many uses for this little guy. I decided to make a little pick-me-up type card with him. His little heart tag actually says LOVE on it, but I covered it with stickles...lol. So you could easily make a valentine with this guy, or a birthday card, baby card, etc....the list goes on. That is one of the many reasons why I love QKR Stampede stamps...they really are so versatile. Well, I am sorry to keep my post quick today, but I have some more cleaning to get done! Thanks for stopping by today, and if you would like more info on this card please head on over to MY BLOG. THANK!!!!! Hello Friends! This is Chris Dickinson sharing with you today! I have two projects to share with you. My first project uses all three of these colors with some yellow too... I just loved this paper and wanted to use it! 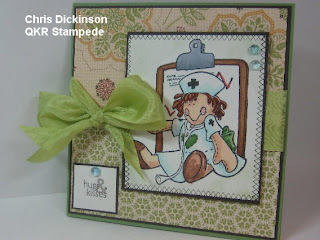 My card uses QKR Stampede adorable image called Nurse on Neenah Cream card stock and Memento Black Ink. Colored my image up with my Copic Markers and did a touch of airbrushing with my BG000 Copic Marker. 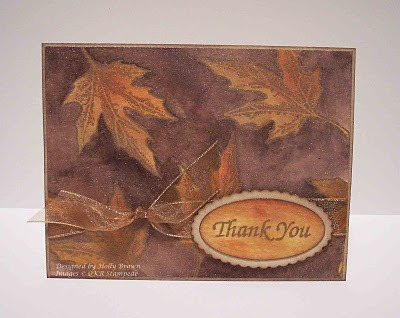 I used SU Autumn Spice Designer Paper that has just a touch of texture- LOVE IT! Colored my image up with my Copic Markers. Added some faux stitching around the Nurse image with SU's retired All In a Row stamp (once of my MOST used stamps ever!) I attached the image with Dimensionals, then added a few Water Dew Drops with some mono glue dots. The card stock I used is Espresso and Wild Wasabi. To top it off, I added a BIG BOW with luscious satin ribbon! 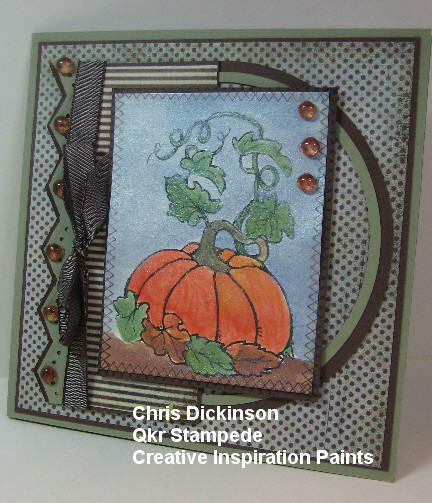 My second card uses QKR Stampede's Pumpkin Vine stamp. It is sooo much fun to color! For this project I used Creative Inspiration Paints, Winter Frost mixed with some ink pad refills and painted with my water color paint brush! These paints are great to work with! Easy to use and clean up easily with soap and water! Best of all... check out that shimmer! Sooooo Pretty! The paper I used is Basic Grey Archaic DP, Moss, Chocolate Chip and Cream Neenah cardstock. I cut the half circles out using my Creative Memories Circle Cutter and punched the edge with a Martha Stewart punch that embossed at the same time. The stitching is once again (the only kind I do! 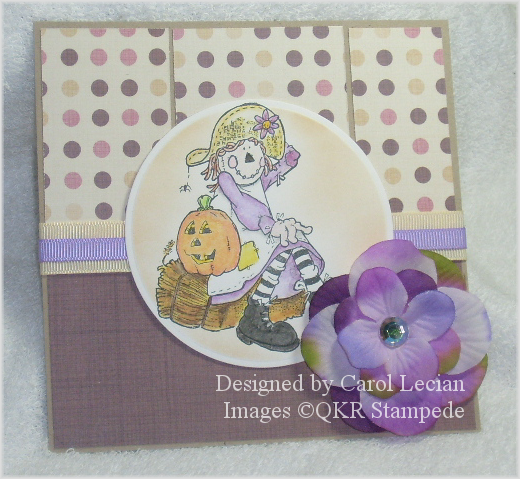 *smile*) is faux stitching with the All in a Row stamp set. I added a bow with Chocolate Satin ribbon and the Cowboy Dew Drops are attached with mini Glue Dots. I hope enjoyed the projects. Thank you for stopping by! Have a wonderful day! 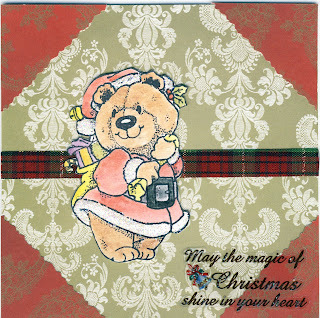 My weekly card ... can you believe, only 3 months till Christmas!!! This is Ceal and I wanted to share a card I made for the Ways To Use It challenge at SplitCoast stampers. The challenge was Ransom. To use cut out letters like a ransom note. 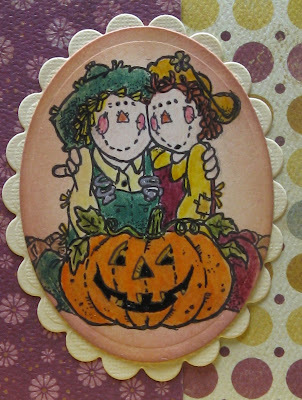 The cute stamp I used is Autumn Friends and I colored it with my Copics. I decided to play with some embossing powder and reinkers with this fabulous leaf stamp from QKR Stampede. I pulled out some watercolor paper and embossed the leaf with some gold embossing powder. With an aquapainter, I filled in the leaves with Mustard and Rust reinkers and set it aside for a few minutes. After they dried a bit, I went around the outside of the leaves with the Chocolate Chip reinker. Yes, that is just one color - it tends to separate when you dilute it with extra water, and that's how you get these cool variations in the chocolate color. Can you see the wonderful shimmer on this card? I dipped a sponge in some shimmery paint and swiped it all over the card. I just love that touch of shimmer! Hello and Happy Wednesday QKR Friends! 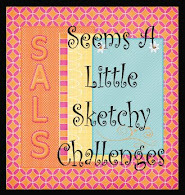 Todays card is a sketch challenge from last week's Sweet Sketch Wednesday. This stamp is Autumn Friends #9206. Background paper is from My Mind's eye. I used a border punch from Stampin' up. I colored the ragdolls with colored pencils. I love this stamp. When I saw it in the QKR store, I had to have it because I thought it would go perfectly with this scripture. I had no idea just how well it would work. I thought it was a treasure chest full of coins - I had no idea they were hearts until I had stamped it out! Imagine my surprise and joy at seeing the hearts - it just made it that much more perfect. The stamps is called Treasure Chest and is available in the store now! Speaking of treasures, you still have a few days to play in along with the QKR blog hop for a chance to win some treasures of your own! 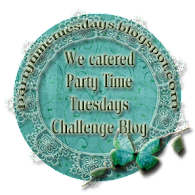 WELCOME to the QKR Stampede "SOMETHING'S BREWING BLOG HOP"! We are so excited to show you what we created for this FUN Blog Hop and SO glad you have come to join in on the FUN! The Deadline for entry will be Wednesday, September 15th at midnight EST. We will announce the winner on Thursday, September 16th on the QKR Stampede Blog.
! See you back here at the end of today's hop...HAVE FUN!! Desiree Havenga - has had internet problems so may be up late! If she isn't up, try to check again when you have time. Hi there! Jessica here with you today. I hope you are all having a great week. It is back to school week here for us, so things are a bit crazy. I have one starting 3rd grade this year and my middle baby is going to Kindergarten. Plus, we are going to a new school this year, so lots of changes for us. Hopefully my youngest can quickly adjust to being "alone" again...lol. I am sure she will love the individual attention though. Well today I wanted to share a card I made using some paper piecing. I think paper piecing is a great way to add some color to your images, and is kinda fun to cut out the tiny pieces in detail. 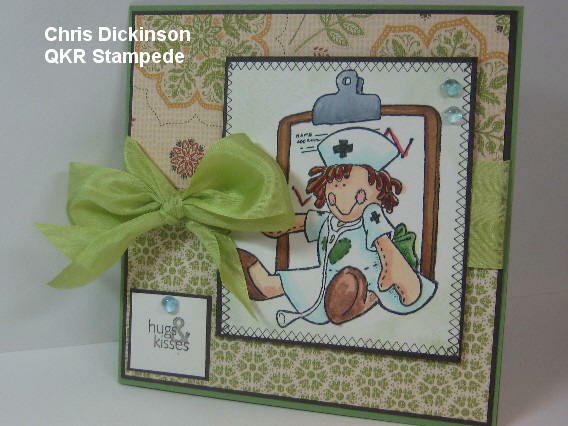 I made this card using 2 of the awesome QKR Stampede images from the QKR Stampede Store. The flowers stamps is called Flower Bouquet. I also used the sentiment called Just a Note. I have gotten so much use out of this sentiment image. It is just so versatile. I did some paper piecing on the flowers. I pieced the leaves and the flower centers. The petals I colored with markers to go with the PP. And...a rarity for me...I decorated the inside! It is very simple, but I cut a couple of the flowers from the PP, and added them to the inside of my card. Now....moving on...tomorrow is our QKR Stampede DT Somethings Brewing Blog hop! The fun starts right here! Join us as the hop goes live at 8am Friday (9/10) morning. Oh...and there is a PRIZE involved! Just hop along with us to each of the Design Team Girls' blog, and don't forget to leave us some "love"...aka comments. Who knows you might have a chance to win a $25 gift certificate to the QKR Stampede Store! Oh what an awesome prize that is too. So please join us, and send your friends to join us also. I have decided to leave you a sneak peek of one of my projects I will be sharing to get you excited with us! The four seasons in birdhouses done previously are just awesome, so my cards are very humbly submitted. More watercoloring, with some embossing in versamark on the green one, and some cutout strips on the other for embellishment. Hello Everyone!!! Welcome to the QKR Blog! I personally LOVE fall... the crisp, cool air, falling leaves, the beautiful array of colors.... Ohhhh - my favorite time of year!!! This Friday, I hope you will come back as we have even more projects using the ADORABLE QKR Stampede images.... I personally love these scarecrows. They are so much fun to color!!! Thanks so much for stopping by! Have a wonderful day!! Good afternoon, QKR fans! Today I have a card to share with you that uses the Autumn Breeze (#8803) stamp by QKR Stampede. 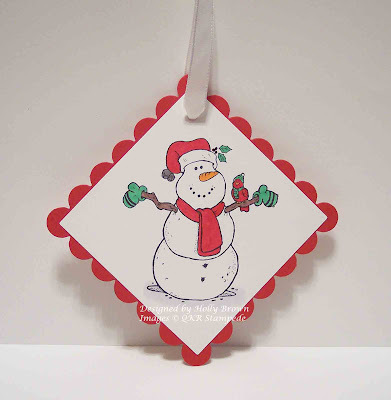 This is another one of the ragdolls stamps and she is just darling! Be sure to stop by each day this week for other project ideas and sneak peeks for the Blog Hop!! Make sure you stop in at the QKR Stampede website and check out all the Fall-themed images. You won't be disappointed, and you just might see one of your favorite images on the Hop!! I don't know about you I am ready for fall to get here especially since it is now September. I loved coloring this pumpkin image Pumpkin Vine. I colored the image with my Copic markers and used a nestie labels 4 diecut and the sponged around the image with distress inks. I added a piece of ribbon i found in my stash to finish it off. I had fun creating this ornament. I cut out two red scallop squares and adhered the backs of these two squares to each other. Then I stamped the snowman on two white squares, colored them, and adhered them on both sides of the red scallop squares. The last thing I did was pop a hole at the top and tie some ribbon to hang the ornament with. This post will remain on the top of the blog until August 31st! Please scroll down to see the artwork of our talented Design Team! We are holding a Design Team Call!!! · This will be a 6 month term - with an option to continue if it is agree-able to the Design Team member and Maribeth. · Post your work to other Forums you are participating in and comment in those areas too. Anyone interested in applying can email Maribeth at maribeth@eurekastamps.com. Include 3 or so items you have created in any medium as long as stamps were used somewhere. Also, list any websites/blogs you may have, any publications you have been in, and any design teams you have been on (all of which are not necessary to be considered but will help us get to know you and your work better). If you have any questions, please let us know! We look forward to sharing MORE with you and seeing your creations too!